Links to right- and left-handed videos are available on my YouTube channel. Tunisian Front Post Stitch (tfps): insert hook from front to back of indicated stitch, with hook wrapping around the back of both vertical bars of stitch, yarn over, pull loop through. Tunisian Back Post Stitch (tbps): insert hook from back to front of indicated stitch, work hook wrapping around front of both vertical bars of stitch, yarn over, pull loop through. Tunisian Knit Stitch (tks): insert hook from front to back, between front and back vertical bars of same stitch, yarn over, pull loop through. Right-Leaning Cable (rlc): On closing, extend first loop (working loop) and remove from hook, with non-hook hand, pinch next four stitches and remove from hook, place cable holder through two stitches closest to hook, move cable holder to back of work, place remaining two stitches back on hook, place stitches on cable holder back on hook (stitches are now crossed), place working loop back on hook and tighten as necessary, [yarn over, pull through two loops on hook] 2 times, chain one, [yarn over, pull through two loops on hook] 2 times. Left-Leaning Cable (llc): On closing, extend first loop (working loop) and remove from hook, with non-hook hand, pinch next four stitches and remove from hook, place cable holder through two stitches closest to hook, move cable holder to front of work, place remaining two stitches back on hook, place stitches on cable holder back on hook (stitches are now crossed), place working loop back on hook and tighten as necessary, [yarn over, pull through two loops on hook] 2 times, chain one, [yarn over, pull through two loops on hook] 2 times. For left-handers, the instructions for the cable lean are mirrored for you. For instance, placing the stitch holder in the back will actually produce a left-leaning cable. You aren’t doing anything incorrectly. It’s just the nature of cables. For a project like this, you can either choose to follow the instructions or you can choose to swap them. It won’t make any difference. 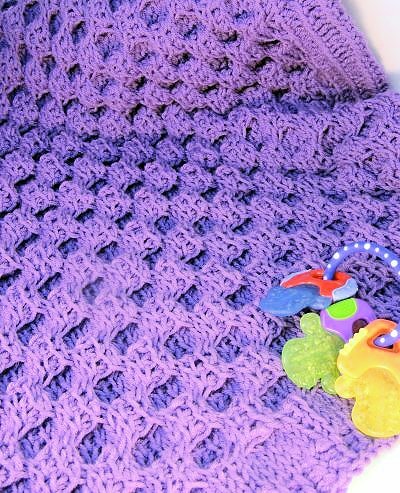 However, there are some stitch patterns that require a cable to lean in a certain direction to make it work. When pulling up loops (part A) of row, always skip the first stitch of the row. Cabling will “scrunch up” the project across the width. A: Ch 91, sk first ch, *insert hook in back horizontal bar of next ch, yo, pull lp through, rep from * across–91 lps on hook (here and throughout). B: Ch 1, yo, pull through 2 lps on hook across–1 lp rem on hook (here and throughout). A: [tfps, tbps] to last 2 sts, tfps, tks in last st.
B: Ch 1, yo, pull through 2 lps on hook across. Rows 3-4: Rep row 2. A: [tfps, tbps] 2 times, tks to last 6 sts, [tfps, tbps] 2 times, tfps, tks in last st.
Row 6: Rep row 5. B: Ch 1, [yo, pull through 2 lps on hook] 5 times, [rlc, llc] until 6 lps rem on hook, [yo, pull through 2 lps on hook] 5 times. For all remaining rows, skip the chain-1 space and leave it unworked. B: Ch 1, [yo, pull through 2 lps on hook] 5 times, *[yo, pull through 2 lps on hook] 2 times, ch 1, [yo, pull through 2 lps on hook] 2 times, rep from * until 6 lps rem on hook, [yo, pull through 2 lps on hook] 5 times. Row 9: Rep row 8. B: Ch 1, [yo, pull through 2 lps on hook] 5 times, [llc, rlc] until 6 lps rem on hook, [yo, pull through 2 lps on hook] 5 times. Rows 11-12: Rep row 8. Rep rows 7-12 twelve times more. Rep row 7 once more. Rep row 5 twice more. Rep row 2 three times. Binding off: *insert hook in front vertical bar and in top horizontal bar of closing ch, yo, pull loop through AND pull through lp on hook (sl st made), rep from * across, fasten off.